After a very busy birthday weekend of spa treatments, massages, facials, great food, wine and plenty more, it’s quite nice to get back into my usual routine of baking, cooking and blogging. I’m sure you’re all working hard when it comes to your fitness goals and making sure you hit them. I hope your January was a great start and you’ve now got some room to enjoy the occasional treat (or two!). Today’s recipe certainly is a real treat. Baklava! This is a deliciously rich and sweet pastry bake that’s filled with layers of pistachio, walnuts and topped off with a sweet syrup to coat (although you can also use honey if you don’t have the time to make the syrup). The process can be on the repetitive side as you’ve got to brush each individual filo pastry sheet with enough butter before moving onto the next one and repeating. It is worth it though! It’s also important to cut the baklava into pieces before baking, otherwise you’re going to have a very crumbly mess on your hands! Start by removing the filo pastry from the container and unroll them onto a large enough board or clean work surface. Cut the pastry sheets in half in a vertical direction. Use a swiss roll tray or regular baking tin with the dimensions of 32 x 23cm if possible (just ensure the filo pastry will fit inside. 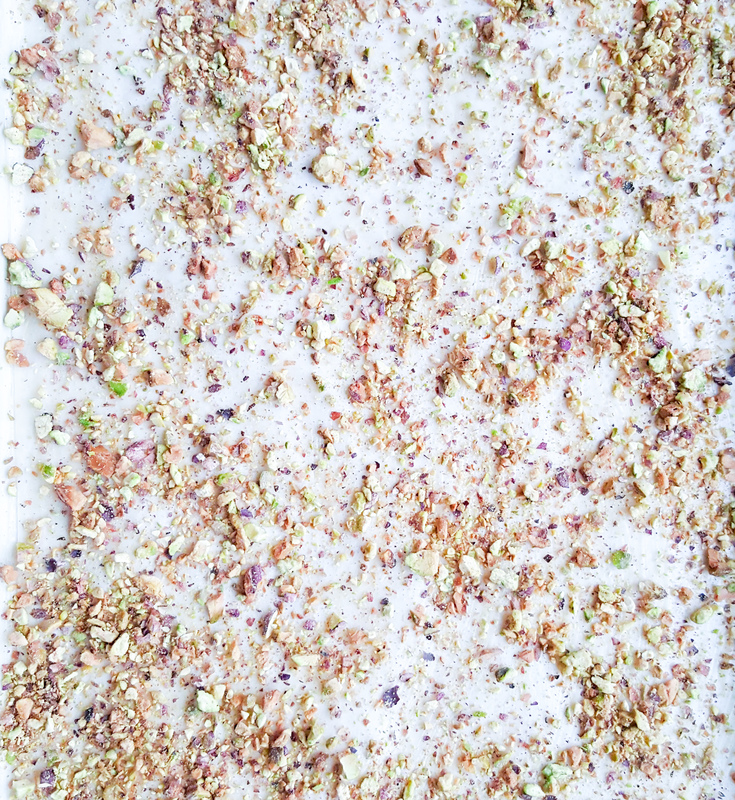 Place the pistachios and walnuts into a food processor until ground. Heat a medium-sized saucepan on a medium heat, add the butter and melt gently. Once melted, remove the saucepan from the heat and take a pastry brush to brush the inside of the baking tray. Take one filo pastry sheet and place on top of the tray, then brush the top with the melted butter. Evenly scatter the pistachio and walnut mix over the top layer, then repeat the process again two more times, buttering three more filo pastry sheets each time. You should have three sets of filling in total. Scatter a final layer of the nut mix on the surface of the baklava. Using a sharp knife cut the baklava into 5cm squares. Pre-heat the oven to 140C (fan-assisted) and once fully heated bake in the centre for 40 minutes and then increase the heat to 180C for 10 more minutes until golden. Whilst the baklava is cooling, make the sugar syrup. Place the sugar and lemon juice into a medium-sized saucepan on a medium-high heat and bring to the boil. Once boiling, stir the liquid so that the sugar dissolves and then reduce the temperature to allow the syrup to simmer gently for 15 minutes. 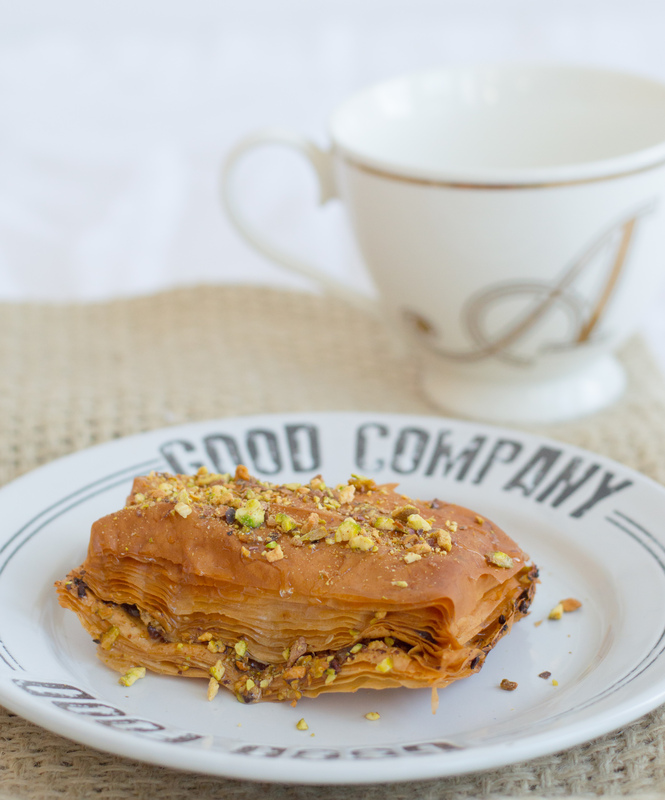 Pour the syrup over the baklava and serve immediately or leave to cool and place into an airtight container.